The Data Feeds (Census) panel is just starting in Las Vegas and Dethdlr and I will be presenting a talk about how EQ2U started and our plans for the future. The big news is, we are unveiling a feature we’ve been working on for some time — Achievements. I wanted to do this feature right, and further, I wanted it easier to read than both EQ2Players, and the in-game Achievements window. I hope you’ll agree that we’ve accomplished that! Go ahead and head over to EQ2U and check out the new Achieve tab on each character. This is just the first public release of Achievements. After SOE Live, we will be working on some additional features which our testers have suggested such as filtering by level, hidden, and completed. 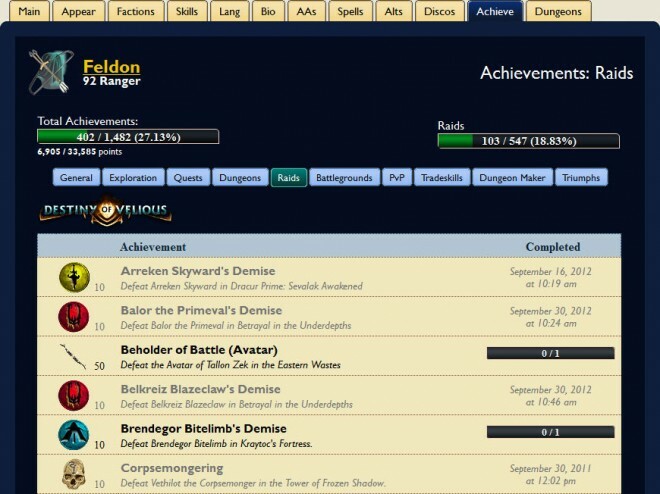 Spoiler Alert: EQ2U lets you see Achievements which are normally hidden (they’re indicated with a special icon). A video of the Data Feeds panel, and the Powerpoint presentation which will be shown will both be available on Eq2Wire shortly after the event is over. wow, out of the park, you’ve hit another homerun! So incredibly useful. I wish more of the people at SoE had the dedication and knowledge to do this kind of work as you do as a fan site and rescource. Random question: do the tradeskill achievement asking to craft 75000 pristine and 100 0000 items show up? They don’t show anymore with the /medalshowall command. awesome but it’s wrong, showing me as not having Flawless or Shorthanded Enraged War boar and in game it shows as having both. Thank you two!!!!!! This is a wonderful page. What a bunch of work, holy cow, it’s wonderful. Really nice work Feldon. This is a feature I didn’t even know I wanted until you provided it! A bunch of achievements I didn’t even know where there. Some of this data is in the feed. Some isn’t. Grandmaster choices are under Spells tab. This is awesome, thank you all very much for making this tab. Wow, another impressive achievement for you guys! You need to have an achievement page of your own! Been using it over the xp weekend. Absolutley brilliant Feldon. Better late then never: FANTASTIC WORK!